Because so many of you seemed to enjoy my post on the Smart Security System Canary, I wanted to share another smart home option with you! If you’re interested in creating a smart home you’re likely thinking about all of the things you can do to the inside of your home, smart lamps, TVs, coffee makers, etc. But what better place to start than at the entrance of your home? Smart locks combine the security and reliability of a trusted deadbolt lock with the innovation and convenience of technology. One of the most convenient features of a smart lock, is that you will never have to search through your purse or pocket for your keys again. The lock will recognize your phone as you approach it and unlock the door for you. If your phone is stolen or lost all of the following smart locks have some way to remove your phones access to your home. All of these smart locks have the same basic features; to be able to lock and unlock your home from anywhere in the world via your phone. All of these locks also give you the ability to give others access to your home from their mobile phones. This access can be unlimited access that you have the ability to revoke at any time, or it can be limited access only available for a certain time period. The top brands of smart locks in the market currently include August, Goji, Kwikset Kevo, and Lockitron. We here at Preston Wood and Associates have compiled our research on the products and user reviews to create this article. We will discuss the distinguishing features of each lock as well as a design comparison and leave it to you to decide which lock is best for your needs. Distinguishing Features – The Goji lock is more than just a smart lock. It is also part home security device. 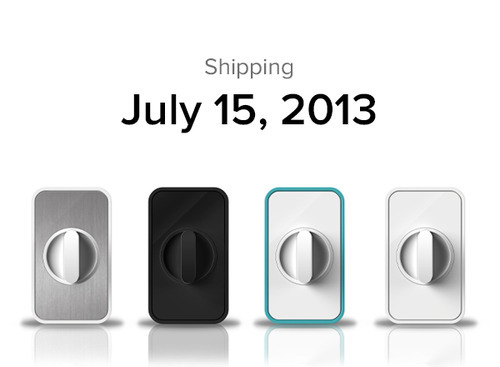 The Goji lock gives you the ability to see who’s at the door from your cell phone before you let them in. Pictures of the visitors will be logged onto your mobile app so that you can see who’s been at your door whether you’re home or not. Goji also has 24/7 customer support, for lost phones, lock-outs or other problems. Appearance – On the outside you can tell that this is no ordinary lock. The Goji has a sleek futuristic design, the lock looks like a round screen attached to your door and will welcome you home as it unlocks. This doesn’t really have any practical purpose, but does add to the futuristic look of the device. On the inside it is a large, but simple, black latch. Distinguishing Features – The Kevo locks come with two free eKeys that grand unlimited access to the lock, any additional keys must be purchased at $1.99 each. Guest keys, on the other hand, are free. Unlike other smart locks, the Kevo will not automatically unlock as you approach the home, instead you must first touch the deadbolt before being let in. Appearance – On the outside the Kevo lock looks like any other Kwikset lock, except for the light-up blue circle around the inside edge that illuminates when the lock is used. The interior device is the same size as the Goji or Lockitron devices, but will likely go better with most interior décor as it has a rather traditional design. Distinguishing Features – Thanks to a built in knock sensor notifications are sent directly to your phone when someone knocks on the. If you lose your phone you can disable your account by changing the password via your online account. The Lockitron does not require you to alter your home locking mechanism at all. Instead you simply need to place the Lockitron over your current lock and it will do the rest of the work for you, a great option for renters who are unable to completely replace their locks. Appearance – On the outside the lockitron looks like a traditional deadbolt lock. On the inside however, it looks like you have something that looks like it belongs in a baby’s room attached to your door. The lockitron comes in four finishes, but none of them would really mix well with most home décor. Distinguishing Features – August excels at keeping track of who is entering your home. Whenever an invitee arrives at your home you are alerted of their arrival and every entry is logged so that you can review who is coming into your home. Like the Lockitron, August does not require you to replace your locking mechanism and as such, is a great option for renters. Appearance – August does not affect the outside exterior part of your lock, but on the inside August is a round cover with LEDs that activate as it’s being locked or unlocked and comes in 4 colors; champagne, red, grey, and black. The lock with the best features is Goji. It has the features available in all other smart locks, but will also take pictures of everyone that is coming to your door! The only downside is that the camera is probably easily avoidable, and it’s not certain you won’t get a picture of a visitor’s shoulder, chest, or hip rather than the face. The added feature is still pretty neat regardless, though it is not necessarily a determining factor. If one were to purchase a lock solely based on looks, we think that the Kwikset has the most traditional design and will look nice with most home décor. However, the Goji’s futuristic design certainly looks nice in homes with a lot of tech already incorporated. If you’re a renter and are unable to completely replace your locking mechanism, Lockitron or August are the smart locks for you to consider as they don’t require you to remove the already existing lock. Smart locks are not perfect, by any stretch of the imagination, but nothing ever is. If a burglar truly wants to break into your home they will find a way. They can break a window, or take a crowbar to your door and easily enter your home and whether or not you have a smart lock will not make a difference to them. Smart locks do not offer any higher or lower level of security than your basic deadbolt. All in all a smart lock is just a convenient and neat way for you to enter your home.